The boys have finished school? Why not let them enjoy a week of sport and funny? They will spend five days at the beach, making every day a different aquatic discipline, alternating too many moments of fun and entertainment. Make every day a different course for the entire duration of 3 hours. 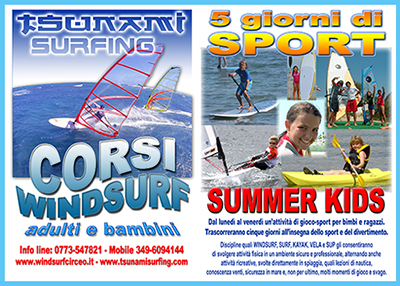 During these days, try the joy of Windsurf, SUP, Kayak, SURF along with many moments of leisure. 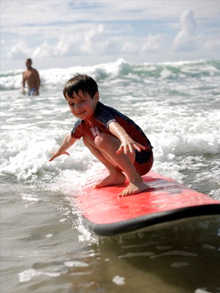 Our instructors are in fact qualified to perform training to children, making their unforgettable moments at the beach. For safety purposes, the course is carried out for 4 or 5 children only from 5 to 10 years. For a smaller number of participants, we recommend others sourses of school. 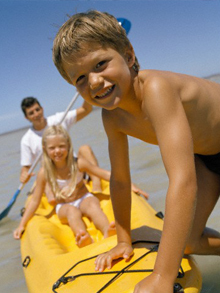 5 days of water sports with flexible schedules established by the group. Too often teaching is delegated to approximate figures or arranged. At our school this is strictly prohibited. We adhere to the strict standards of the federation WINDSURFING imposing our instructors teaching high ability and strong teaching skills. Leave your kids with us to spend 5 days of sport and fun! 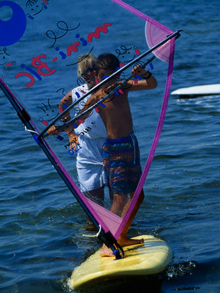 Initiation through to Windsurfing rig suitable for children. Small plates and covered with soft pads to avoid trauma and sails sized for height and weight. We train tomorrow's champions. Lessons on how to learn this new sport. Practice on the sand and in the water gaits for the best quality of learning and evolution. Sport for all: children, girls and boys. Lessons on how to make paddles, sports and fun, to give way to vent all the energy of the younger ones. Exercise with safe routes constantly monitored by the instructors. Initiation to SURF. The students will learn the postures and gaits on the table by SURF. 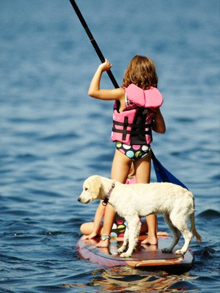 Paddle lying down, twirl and glide on the foam on the waves to the shore. Fun!